What could be better than a trip to Vermont in the fall? Well, after spending some time in the kitchen this weekend, I’d venture to say an apple pie made with freshly picked Vermont apples and pure Vermont maple syrup might be even sweeter than seeing this scenic state. Start by preheating the oven to 425°F. Place one layer of pie crust along the bottom of an ungreased pie dish. Use a fork to make sporadic holes in the crust. Place the dish in the oven, and let it cook for about 5-8 minutes or until just slightly golden. While the bottom layer of the pie is cooking, peel and slice 8-10 apples. I like to use a variety of tart and crispy apples for a better apple flavor in the finished product. For this pie I used Empire, Cortland, and McIntosh apples. Once your apples are sliced, toss them together with the brown sugar, maple syrup, cinnamon, and nutmeg, and pour the mixture onto the pre-cooked crust in the dish. Take a second pie crust and use a pastry wheel to make a few slits in the dough, then place the crust over the top of the apples. Adding a few vents in the top of the pie allows for steam to be released from your pie while it’s cooking. At this point, you could pinch the top crust along the edges and throw your pie in the oven, but if you’re anything like me you want your pie to be just as pretty as it is delicious. Since I tend to eat with my eyes as much as (if not more than) my mouth, I decided to add a braided edge to my apple pie. To do this, take your third layer of refrigerated pie crust and cut three long strips with a pastry wheel. Pinch the strips together at one end and make a braid. You may need to cut out more strips to continue the braid so that it’s long enough to fit the circumference of the pie. Once you’re done braiding, brush the braid with a little water to seal it, and place it around the edge of the pie. The final step is to add an egg wash to the crust. Beat one egg and a dash of water together in a small bowl, then brush it all over the top of your pie. This gives the crust that glazed, golden finish when it comes out of the oven. 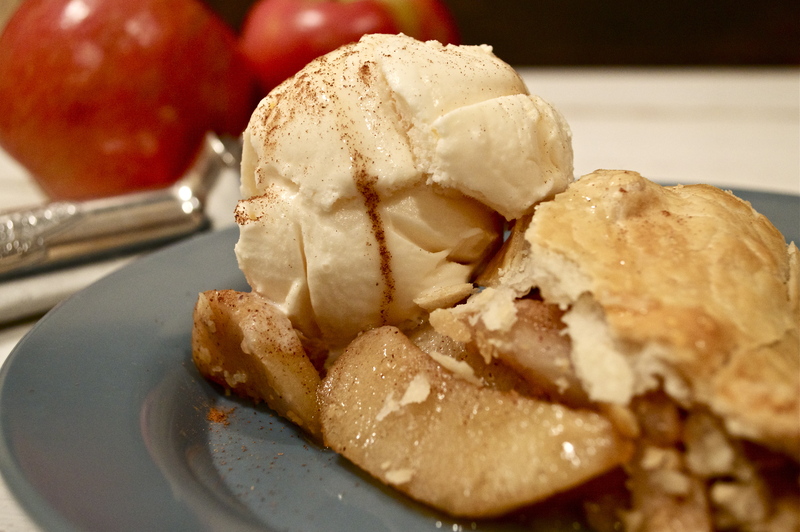 Let your pie bake for about 50 minutes or until the apples are tender and the crust is golden brown. Serve with a generous scoop of vanilla ice cream, a drizzle of maple syrup, and (if your feeling really decadent) a sprinkle of cinnamon, and enjoy!